Throughout the majority of the three hour RAW on Monday, I kept having the same thought. Did we really need an extra hour just to see clips of Brock Lesnar beating up guys who are now on the TNA roster? Our good friend Adam Testa summed up the night pretty well in his article for the Baltimore Sun. Besides being bored with the show, there were several moments that left me scratching my head, as the logic involved was even more illogical than normal. In no particular order here are things C&C Music Factory would look at and say Hmmm. First up, the CM Drunk situation. Chris Jericho claimed Punk was drinking in the hours leading up to a WWE event and should therefore be stripped of the title based on some unknown rule. Johnny Ace orders Punk to take a field sobriety test in the ring to see whether or not Punk was in fact drunk. 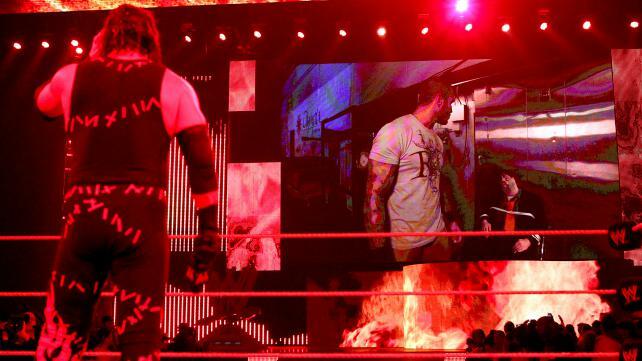 Why didn’t Punk have to take a Breathalyzer test? That would have given an accurate result and saved the audience 10 minutes of bad comedy. Instead we got Punk acting drunk, the police officer determining Punk to be drunk and then? 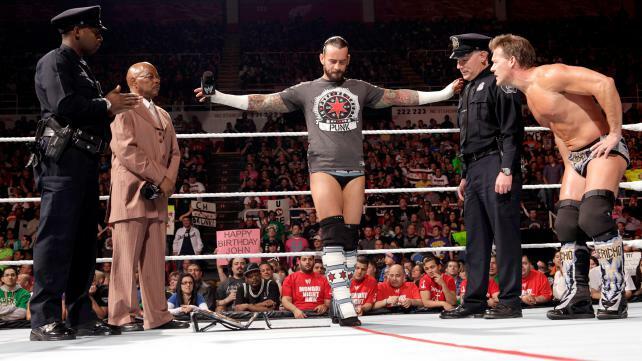 Instead of Teddy Long stripping Punk of the WWE Championship, the Officer leaves, Punk screws up the alphabet in reverse, moonwalks and beats up Jericho. The most mind scratching part of the event was the rule about WWE Champions not being allowed to drink before a show. Has this always been on the book, or was it an amendment added after Steve Austin was done being champion? I’m pretty sure Austin used to drink DURING WWE shows. Several fans will most likely say, the new rule isn’t that big of a deal and it was there for the segment so just shut up and enjoy the show. To that I say, no. I’m tired of having my intelligence insulted. I have not problem with rules appearing on the book out of nowhere, but don’t make them contradict one of your biggest stars in the last 15 years. As we talked about last week on “From the Rafters” radio, each wrestling company sets up rules in their own universe and then builds on those rules. The good promotions will adhere to those rules. Bad promotions will ignore those rules and treat each show differently and do whatever they want whenever they want to fit the story they want to tell. Since Vince McMahon likes to talk about how WWE is an entertainment company and they “make movies,” the same rules apply in TV and films. Consistency is a trait of solid storytelling. Kevin's 1-2-3 Cents: I couldn't agree more. Is this really how two superstars, who claim to be "the best in the world", should be booked? As Gorilla Monsoon would say, give me a break! This is more of a nitpick and doesn’t have anything to do with logic, but why are the Intercontinental and United States champions wrestling in tag team matches instead of singles matches? 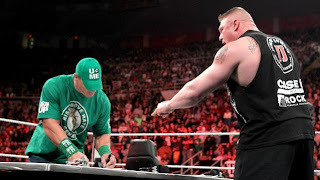 The main attraction of Raw was the contract signing between Brock Lesnar and John Cena for their match this Sunday at Extreme Rules. I don’t like contract signings because they don’t make sense to me. Does every match have a signed contract? When wrestlers show up to TV shows do they have to sign a contract with the person they are facing that night? How do impromptu matches happen if there’s no signed contract? 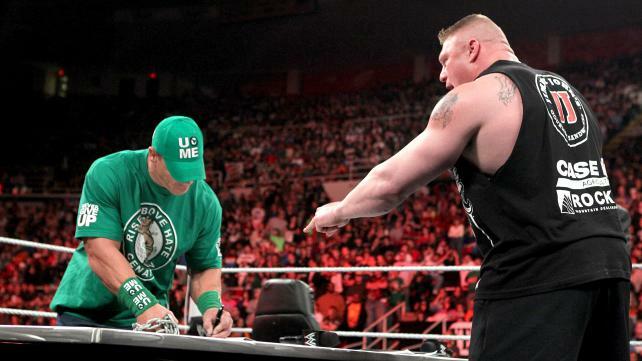 As I asked during RAW on our Facebook page, what would have happened if Brock or Cena didn’t sign the contract? Would a match WWE has been promoting and using as a selling point for the pay per view for the past 2 weeks not have taken place? What exactly did the contract signing accomplish? RAW started with everything in place for the contract signing. Well everything except Brock Lesnar. Are we to believe Brock doesn’t have to show up before the show starts? That’s another pet peeve of mine. Wrestlers showing up after the show starts? The contract signing got postponed until the end of the show, even though Brock showed up at least an hour prior but when it was time for the signing, John Cena was nowhere to be seen. Was he in the bathroom? Did no one tell him the contract signing was coming up? Why wasn’t he waiting to come to the ring? Maybe he fell asleep when Brock started talking too. This whole segment in my opinion was horribly written. Brock has been with WWE for 3 weeks and he’s just now making a list of demands he wants before getting into the ring? I also don’t understand John Cena’s character. He’s been the focal point of the company for eight years. He’s defeated everyone put in his path in that time. He loses one match to a former superstar and has another former star get the better of him and now he’s all super serious moody suffering from lack of confidence? I could understand if Cena talked about Brock’s UFC career and there was mention of their feud where Cena said Brock’s beat him before and Cena doesn’t know if he can beat Lesnar. While I think Edge cut a good promo and explained the reason why Cena needed to beat Lesnar, Cena’s mime routine last night didn’t do anything to make me care to see Brock vs. Cena. Maybe it’s just me. Kevin's 1-2-3 Cents: I'm still having trouble getting interested in Brock Lesnar. I didn't like him in his first stint, and I'm not in to him now either. I did however like the selective editing with the opponents that Lesnar destroyed early on. Jeff Hardy, Hulk Hogan, and Kurt Angle. Childish, yes. Funny, indeed. Because I can’t think of anything they can do to make me care about a Kane vs. Randy Orton match, I’m not going to mention the segments with Paul Bearer. Trying to think if there’s anything else I need to complain about. I think I’ve said enough. Kevin's 1-2-3 Cents: I'm going to contradict myself here with this one, but I'm a wrestling fan. I didn't mind the Paul Bearer bit. It's become a running joke of sorts. He's become the Kenny from South Park. How many times will they kill off Paul? It's inconsistent for sure, but hey it's fun in my view. One other note from me, why in the heck is a Bella twin the Divas champion? If they wanted to get the belt off of Beth Phoenix (which I still think was the biggest injustice of the night) why not have her drop it to Natalya or Tamina Snuka? Facebook, Twitter, YouTube. Stay up to date with our ramblings.